A math professor at MSU taught us how to convert the size of fires in acres to square miles to help visualize them better. When you see news about fires throughout Colorado, it's most often reported in acres. However, that can be hard to visualize for a lot of people. A Next viewer named Chuck sent us a suggestion: explain how large the fires are in square-miles as opposed to acres. Instead of the Next team pulling out our calculators and doing the math ourselves (you're welcome), we spoke to Kellie Zolnikov, a mathematics professor at Metro State University to help explain fire measurements in simpler terms. So, why do we use acres to measure the fires in the first place, rather than a more commonly used unit like miles? "If we were gonna try to convert an acre into something like miles, miles is really a linear unit, so we have to go into square miles," said Professor Zolnikov. As we all know, a square-mile is another measure of land area that can be thought of as one mile on each side of a square. One square-mile contains 640 acres. Maybe that's still hard to visualize, so think of it think way: one square city block is about 2.5 acres. This means that 256 city blocks would fit into one square mile. The total amount of land that is currently burning in Colorado covers about 140,000 acres. To convert this size into square miles, all you have to do is divide by 640 acres (since in there are 640 acres per square mile). 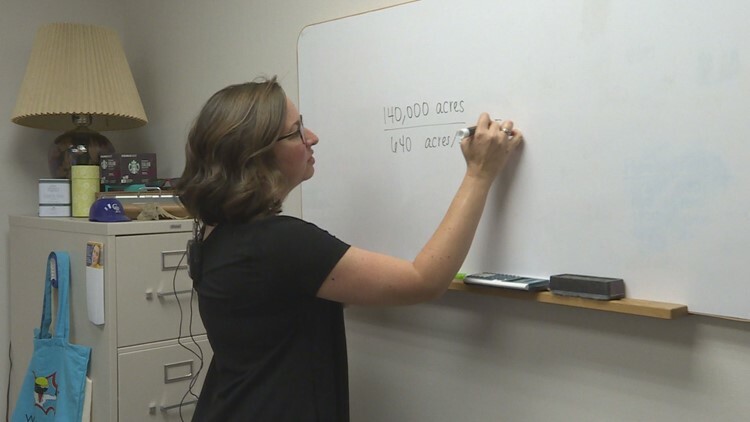 Metro State University Professor explains how to convert acres into square miles. 140,000 / 640 = 218.75 square-miles of land burning in Colorado right now. Professor Zolnikov tells us that measurement equals 15 miles by 15 miles of land. Have anything else you'd like us to calculate for you? Email us at next@9news.com.